It’s your turn to cook dinner. Or maybe you’re trying to wow on a third date. It’s a birthday. It’s an anniversary. Whatever the occasion, you could scour the Internet for an intricate recipe. Or you could pump the brakes. A meal doesn’t have to be complicated to be impressive. Sassoon also recommends cleaning while you cook. “It’ll give you time to enjoy the night when you’re ready to relax with your date,” she says, which is key whether this is a brand new relationship or 10 years into your marriage. One more thing that’ll make you feel relaxed? Making these foolproof recipes. With Sassoon’s tips in mind, read on for five of our favorite recipes from top chefs. Prep the cauliflower by cutting it in half, trimming off the leaves and core, and reserving it. Then, cut the cauliflower into small bite-size florets and reserve the stalks. Chop the core, stalks, and leaves. Combine the oil, onion, garlic, and cauliflower leaves, stalks, and core in a large pot. Season with Maldon salt and cook over medium heat, stirring frequently, until the leaves are just beginning to wilt (about three minutes). Reduce the heat to low and cook, stirring frequently, until the cauliflower leaves are just tender (about 18 to 20 minutes). Add the cauliflower florets, chopped kale, red pepper flakes, and 1 cup water, and bring to a simmer over medium-high heat. Reduce the heat to a gentle simmer. Cover and cook, stirring occasionally, until the cauliflower is very soft and almost falling apart (22 to 25 minutes) Add the butter, stirring gently until it melts, then season well with Maldon salt and remove from the heat. The cauliflower ragú can be prepared up to three days ahead. Let it cool, then cover and refrigerate. Reheat in a large pot over medium-low heat before adding the pasta. Bring 6 quarts of water to a boil in a large pot and add 3 tablespoons Kosher salt. Drop in the pasta and cook until it’s al dente. Drain the pasta, reserving about ⅔-cup of the pasta water. Add the pasta and ⅓-cup of the reserved pasta water to the cauliflower ragú and stir, while tossing over medium heat until the pasta is well-coated (add a splash or two more of the reserved pasta water if necessary to loosen the sauce). Add the cheese and stir. For richness, sprinkle with bread crumbs and rosemary. Serve with additional grated cheese on the side. “Lentils are a really versatile ingredient and have high nutritional value, while beets are more flavorful and colorful when harvested in the fall,” says Leandro Minelli, Chef de Cuisine at Grand Hyatt Baha Mar in the Bahamas. A few simple steps and dinner is served. Place the lentils in a medium saucepan, cover with three inches of water, and add the onion and bay leaf. Place over high heat, bring to a boil, then reduce the heat to low and simmer until the lentils are tender but still holding a shape, 20 to 30 minutes. Add 1 teaspoon salt toward the end of the cooking time, and more water if needed. Drain the lentils and discard the onion and bay leaf. Meanwhile, toss the beets and carrots with 2 tablespoons of the olive oil and ½-teaspoon each salt and pepper. Roast in the oven until browned and tender, tossing halfway through cooking, 25 to 30 minutes. In a small bowl, whisk together the yogurt, garlic, lemon juice, chopped parsley and dill, ¼-teaspoon salt, and the remaining 1 tablespoon olive oil. We’ve all had bland tacos—today is not that day. 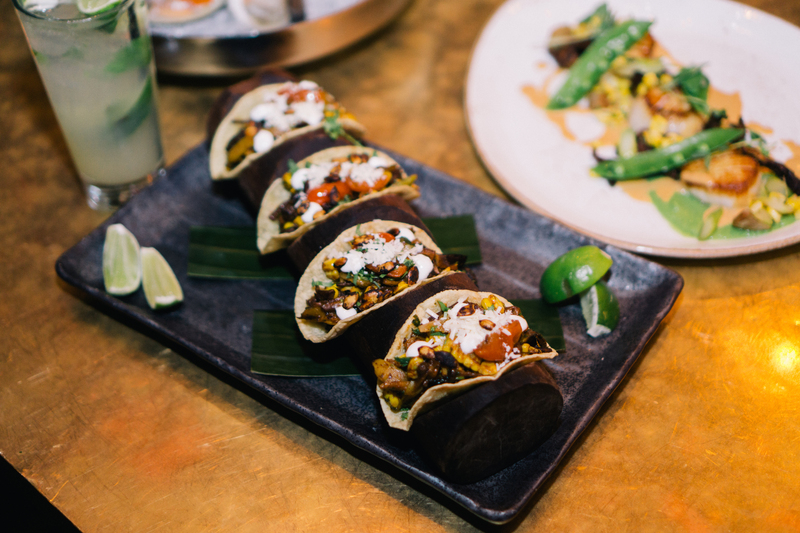 “The key is to use a wide variety of vegetables, your favorite tortilla, and quality Morita chilies for the salsa,” says Executive Chef Brad Warner of Bodega Negra at the Dream Downtown hotel in New York City. Make the Salsa de Chipotle: Roast tomatillos, tomatoes, garlic, and onions in oven. Lightly toast Morita chili peppers on stove top or flat grill. Place all ingredients in blender and blend until smooth. Season with salt to taste. Make the mushrooms: Lightly sauté shallots in oil and butter, then add mushrooms—cooking until tender. Glaze with soy sauce or brown sauce of choice. Add seasoning with salt and pepper, to taste. Sautée corn, eggplant, asparagus, and mushrooms in butter or olive oil until heated through. Add salsa, then tomatoes and cilantro. Toss to combine. Season with salt. Serve in tortillas. Garnish with crema, cotija, a squeeze of lime juice, and cilantro, if desired. An elevated Caesar salad? You’re one fancy dude. 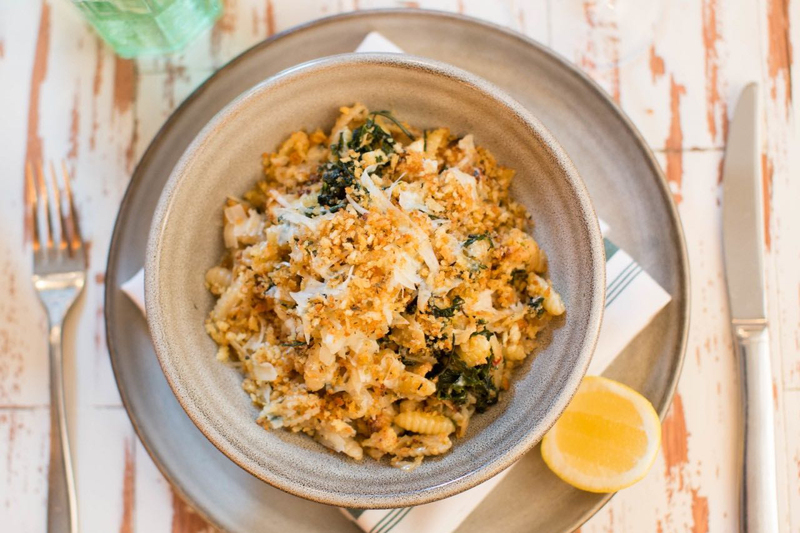 Loaded with parmesan and anchovies, this dish really packs a umami punch. 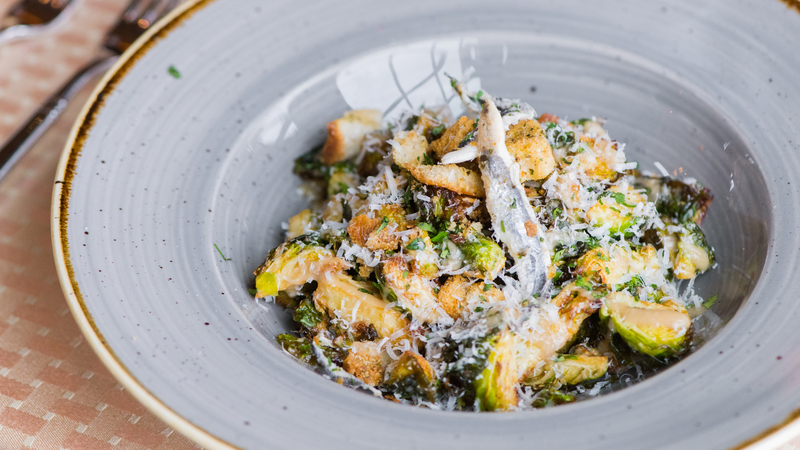 “In our signature restaurant Harrimans, we put a fun little twist on a classic Caesar salad by using Brussel sprouts and quick-frying them in hot oil. 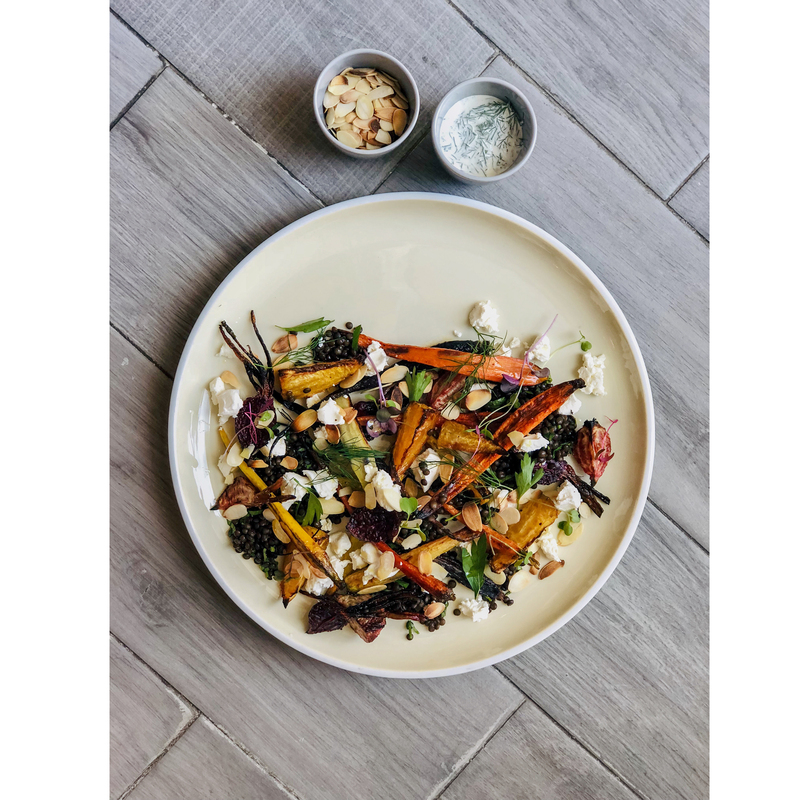 It adds a unique depth of flavor to the popular salad,” says Ryan Arensdorf, executive chef at Salamander Resort & Spa in Middleburg, Virginia. Make the dressing: Purée all the dressing ingredients but the oil in a blender and slowly emulsify the ingredients as you add the oil. Heat a deep fryer with oil to 375º F in a fryer basket (or use a deep pot and your frying oil of choice). Quick-fry the Brussels sprouts for 20-30 seconds, until lightly browned and al dente. Remove to dry on paper towels. Season lightly with iodized salt. Let cool to room temperature, about five minutes. In a medium-sized mixing bowl, toss the sprouts with the vinaigrette. Place in a serving bowl and top with fresh grated parmesan, croutons, and the anchovy files. 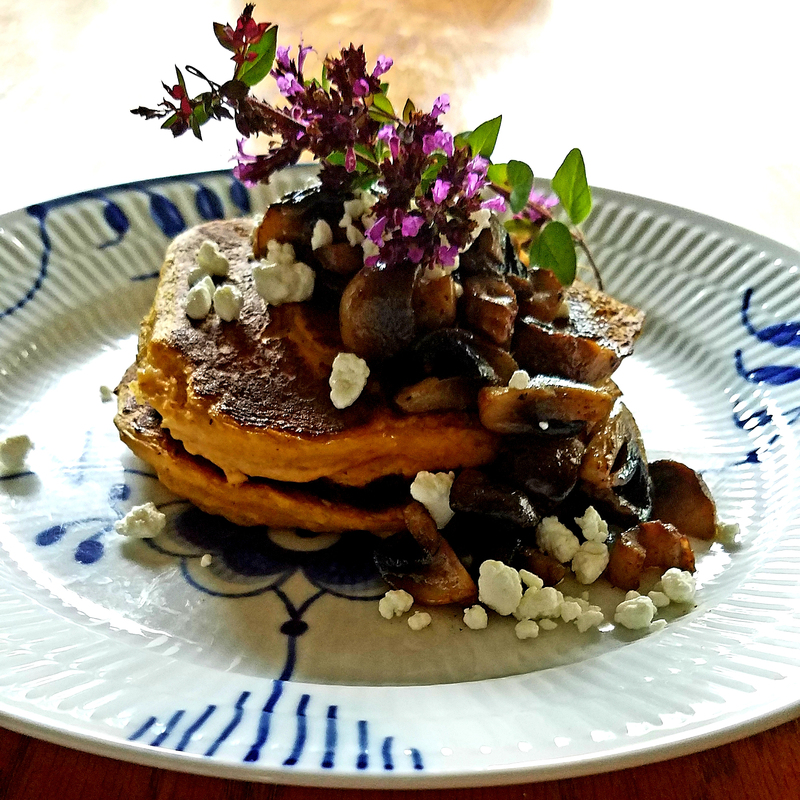 This dish from chef Kevin Soucy of Rí Rá Irish Pub in Portsmouth, New Hampshire, makes for an easy, yet impressive entrée. If you’re not familiar, boxty is a traditional Irish potato pancake. Mix dry ingredients. Beat eggs and fold into dry ingredients with pumpkin puree and cold mashed potatoes. Stir in milk until smooth. Refrigerate for half hour. Heat two tablespoons oil in a skillet over medium-low heat. Spoon in batter and spread into circle to desired size. Cook until batter bubbles on edges and center starts to set. Flip and cook until lightly browned. Melt butter in sauté pan. Quarter mushrooms and roughly chop sage. Sautée mushrooms and sage in butter, season to taste with salt and pepper. Place boxty in center of plate. Spoon mushrooms over top and sprinkle with goat cheese. Enjoy with a pint of Guinness.